Welcome to horse country! Spectacular views from this Jagoe house. It is Energy Efficient and built with quality craftsmanship, an open floor plan with soaring ceilings. 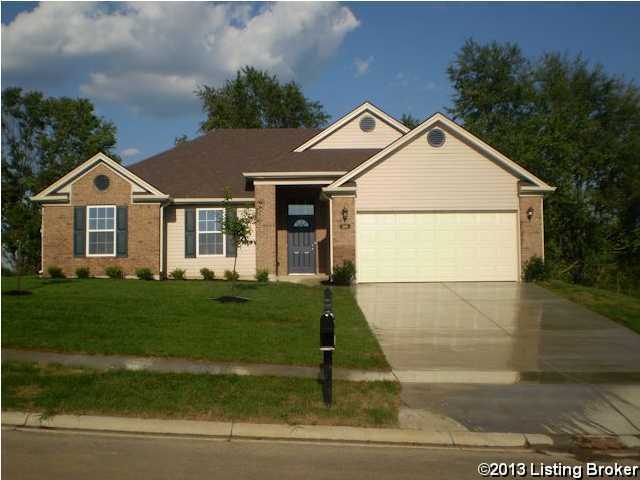 3 bedrooms, 2 baths, a Master Suite w/ walk-in closet. Numerous upgrades include all brick exterior, handicap accessible shower, upgraded HVAC unit and extended garage. This home has been lovingly maintained, less than 5 minutes from shopping, restaurants, entertainment and I -64. Meadow Glen is a subdivision within the city of Shelbyville, Kentucky. There are currently 0 Homes for Sale within Meadow Glen, with asking prices ranging from $0 to $0. The average list price per square foot of the available inventory in Meadow Glen is $0, which is the Shelbyville average of $280. The Average Sales price of all sold real estate in this subdivision for the past year is $180,300. Recent comparable homes have been selling for 97.86% of their asking price. Waterfront homes represent of the available Meadow Glen inventory. The population of Shelbyville, according to the 2010 Census, is 14,045. The total number of households in the zip code of Meadow Glen is 10,408, with an average household size for of 2.63 people. The total number of renter households within the zip code of 40065 is 3,590, which means that 65.51% of households in this zipcode are owner occupant households. 328 Tipperary Crossing, Shelbyville KY 40065 is a Home, with 3 bedrooms which is recently sold, it has 1,277 sqft, 75X120 sized lot, and 2 Car Garage,Attached,Entry Front parking. A comparable Other, has bedrooms and 0 baths, it was built in and is located at and for sale by its owner at $ 0. This home is located in the city of , in zip code , this County Other, it is in the Subdivision, and Town N Country are nearby neighborhoods.